Boil the water and pour over the prunes. Soak the prunes overnight out of the refrigerator. Strain the water from the prunes and reduce over a high heat to approx. 150ml. To make the prune sugar syrup, add 150g sugar to the reduced liquid and set aside. Boil the Banyuls wine and pour over the soaked prunes. Soak again for at least 2 hours. Once the prunes have soaked, strain off the Banyuls and return to a large shallow pot. Set aside the prunes. Add the orange juice, vinegar and prune sugar syrup to the strained Banyuls and cook over a low heat until reduced by half. Pit the prunes, retaining the seeds. Add the seeds to the cooking liquid as this will thicken the sauce as it reduces; cook the sauce over a low heat until it has thickened. Strain the sauce and remove all the solids. Return the pitted prunes to the sauce and cook over a low heat. The sauce is now ready to serve. Prepare the duck by washing and drying well, and remove any excess fat in the cavity. Remove the neck and any of the remaining innards. Pound all the dried spices with the ginger and salt in a mortar and pestle. Add the ingredients with the Ketchup Manis and mix well. Coat the duck all over in the spice and Ketchup Manis mixture. Leave the bird to marinade for at least 2 hours in the fridge. Remove the duck from the fridge and bring to room temperature. Place the whole peeled onion and the whole mandarin in the cavity of the bird; this will help to keep the duck’s shape while steaming. Steam the duck* on full steam for 1 hour, then remove from the steamer and allow to cool. Once the bird is cold, remove the onion and mandarin. Split the duck in half, first cutting the breast bone in half, followed by removing the back bone. The duck is now ready to be grilled or can be refrigerated for grilling later. Grill the duck over a charcoal fire until the skin is crisp and well-charred all over. Rest the duck in a warm place until ready to serve. Cut the duck into pieces and dress with a little olive oil. Wash the radicchio and slice finely removing any large white pieces; the finished weight will need to be 350 grams. In a wide heavy-based saucepan, heat the olive oil and butter, add the onions and cook until translucent without colour. Add all other ingredients and reduce until the liquids are almost all evaporated and the vegetables are almost sticking to the pan. Remove from the pan and cool slightly and blend to a very fine puree. Set aside until ready to serve. Combine all ingredients and mix well. Lay the mix thinly on a non-stick baking tray and bake at 160°C for 20 min. Remove from the oven and cool. Once cool, break up the caramelised walnuts in a blender to a course crumb. Store the crumb in an airtight container. 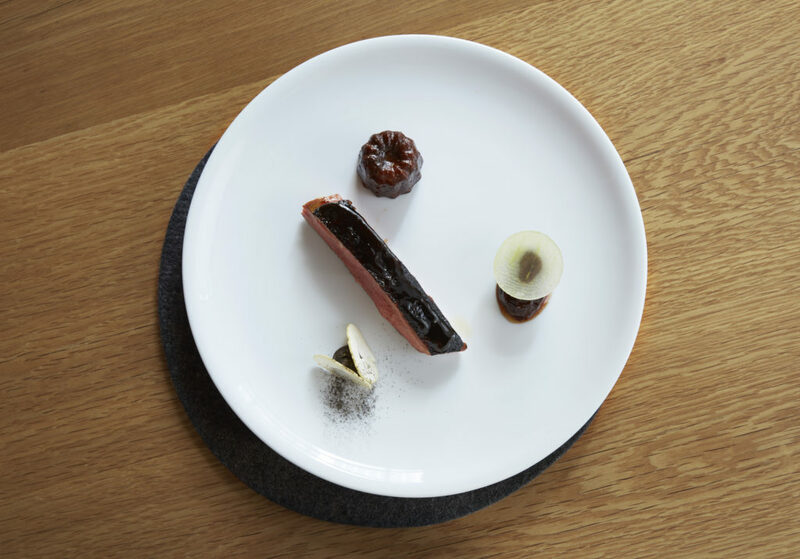 Arrange the chopped duck on a large serving plate with the stewed prunes and sauce, and serve the radicchio puree and nougatine crumb on the side.